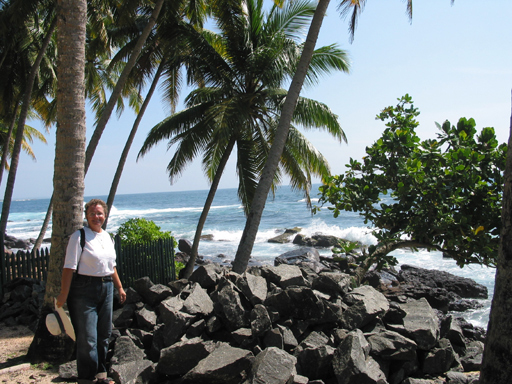 Galle was the first "Far East" port and it was at the end of an hard sail from Male, Maldives. These two facts heighten the excitement of being here. It is for sure a somewhat shabby old city, but the juxtaposition of the ramshackle shops in a beautiful tropical setting and the dusty streets with women in brightly colored sarees captured our imagination. Among the ramshackle shops Galle still keeps a few vestiges of its colonial past. 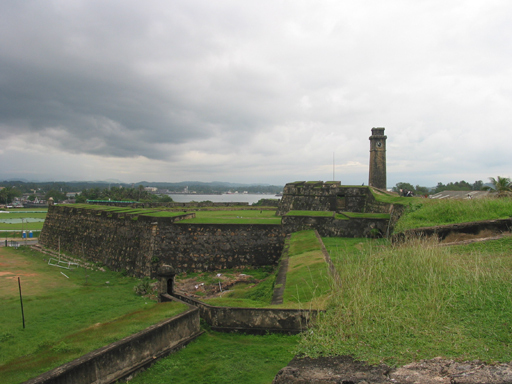 The old Dutch Fort, which was Portuguese until 1640, guards the entrance to Galle Harbor and it is listed by UNESCO as a World Heritage site. The interior of the fort is lived in and contains houses, schools, shops, hotels and restaurants. The views from the ramparts of the old fort are spectacular. 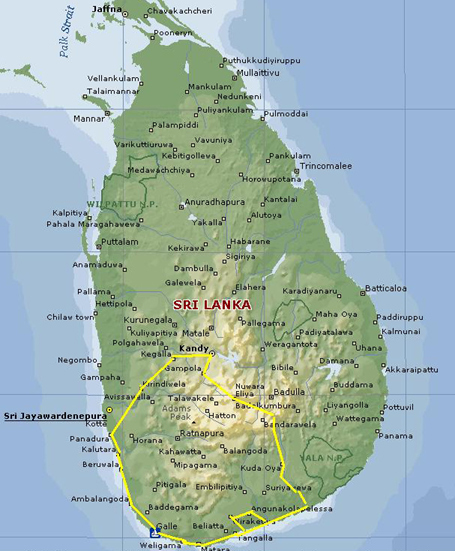 All the shipping from Singapore to Europe pass within a couple of miles of Galle. 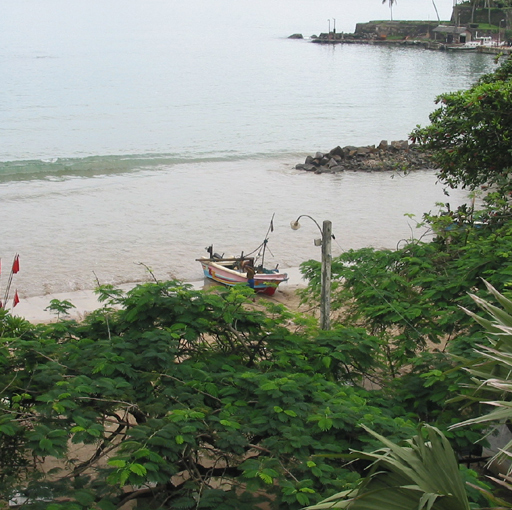 A fishing boat beached in a small cove beneath the ramparts being readied for another night's work. 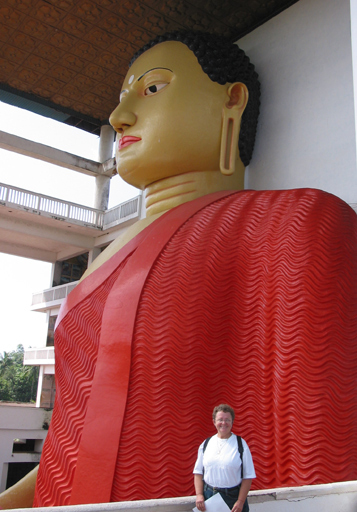 Early on in the planning process we had decided that we would spend some time in Sri Lanka and see the country. The Blue Water Around the World Rally was scheduled to arrive in Galle just after Christmas time and we wanted to be on hand to defend Callisto during the arrival and departure of so many boats. A week long drive around the southern part of the country was to be the first effort to fulfill the goal of seeing the country and get us back before Christmas. A second trip to cover the parts we would miss was planned for after the New Year. 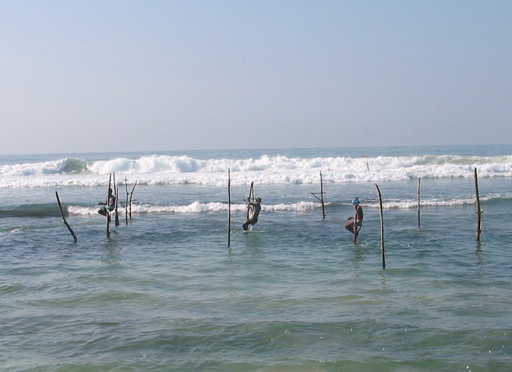 A unique way of fishing in the surf is demonstrated by Pole-fishermen along the south coast. Buddhism is by far the dominate religion. 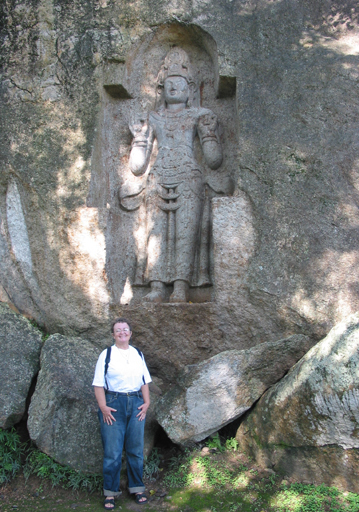 Representations of Buddha range from the very old as here with these stone carvings on the left to the modern and largest in Sri Lanka, on the right. The keepers of the faith are very much a part of the fabric of Sri Lanka. This kindly monk provided us with a blessing to keep us safe. 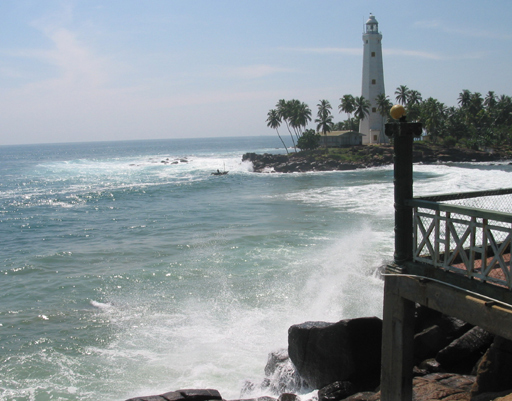 Donda Head Point is the southern most point of Sri Lanka and therefore the southern most of the Indian subcontinent. South of here is only ocean until you reach Antarctica. 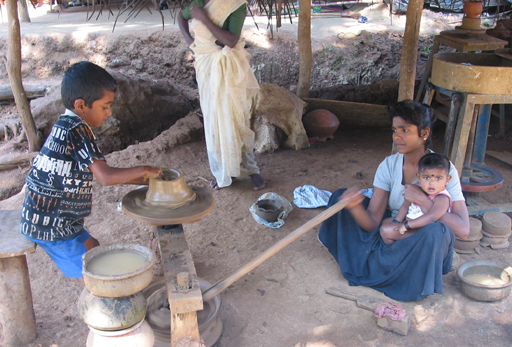 A young potter at work. At this shop along the road on the south coast a whole family of three generations including this young girl make beautiful lace. If they are alive today it would be a miracle because their house/shop is less than 500 yards from the sea which, in less than a weeks time, will rise up and destroy everything within 2000 yards of the shore. We will never know. 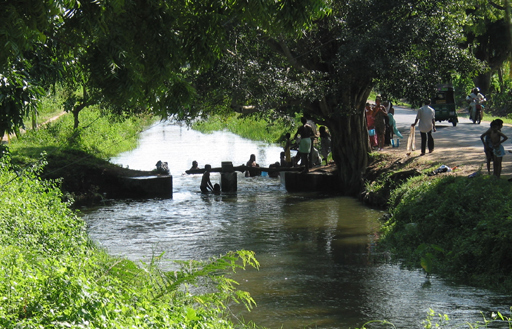 Bath time for those lucky enough to live near a stream. 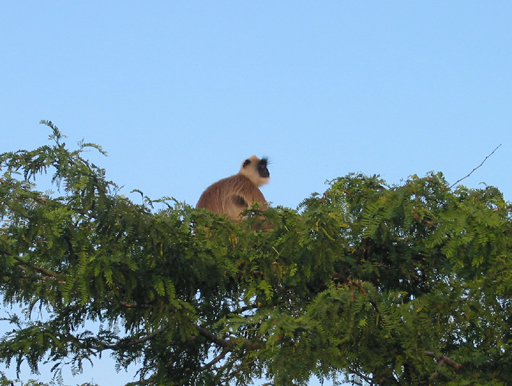 Langur monkeys are a common sight in Sri Lanka. 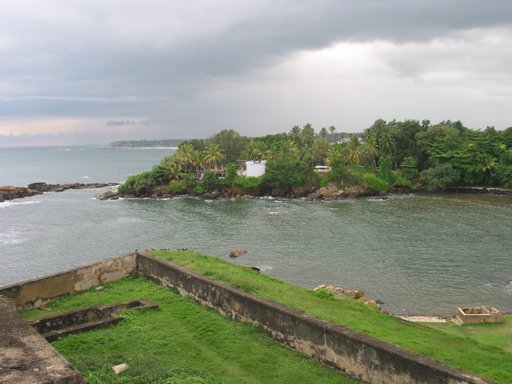 A troop played in the trees and roof tops of the houses adjacent to the port in Galle. This purple faced fellow however, was in the Bundala Bird Sanctuary. 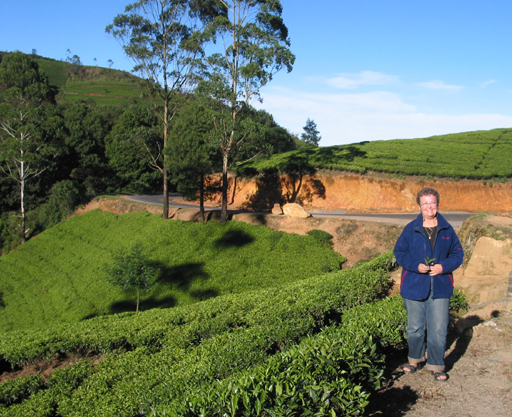 The highlands of Sri Lanka, where this tea plantation is, provides a break from the hot and humid tropical climate of the coast. 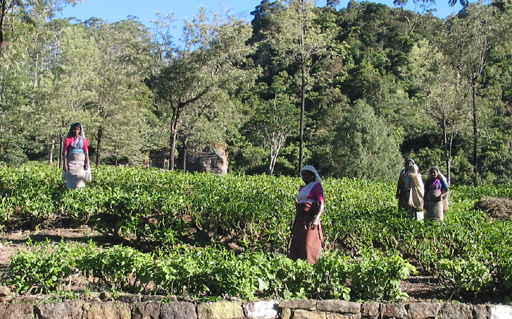 Tea of old Ceylon is still harvested by hand, only the growing tips of the plant are picked. Backbreaking work done only by women. 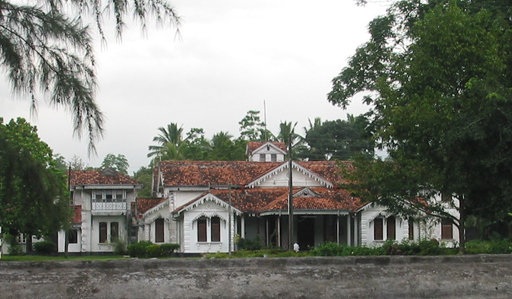 The botanic gardens at Peradniya were laid out as the queens gardens in 1371. They contain a large variety of plants from all over the world. 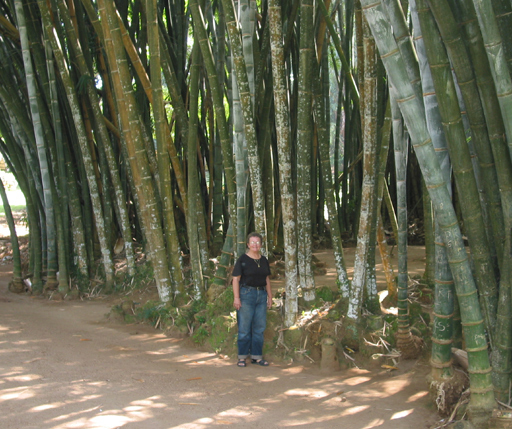 Who knew bamboo grew this large? 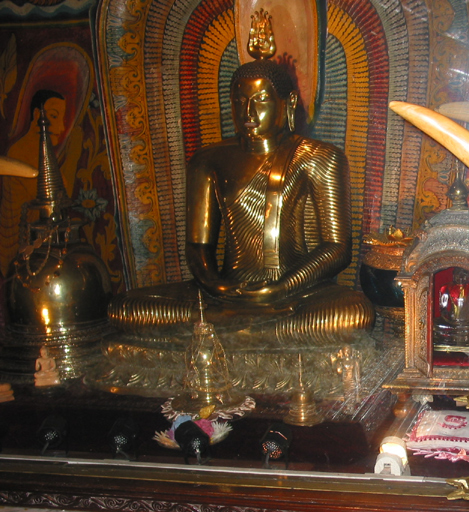 The Temple of the Tooth houses one Buddha's teeth. Our visit coincided with one of the few occasions that the public are allowed to see this special relic. The crowds of the faithful were huge and we saw mostly the backs of peoples heads, but like many things of religious significance it is the ceremony that counts. 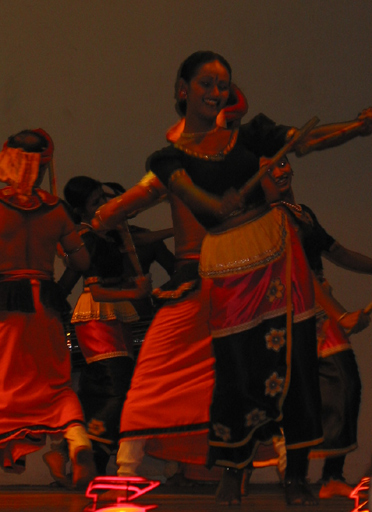 Dance troupes performing for tourists keep the Sri Lankan traditional culture alive. 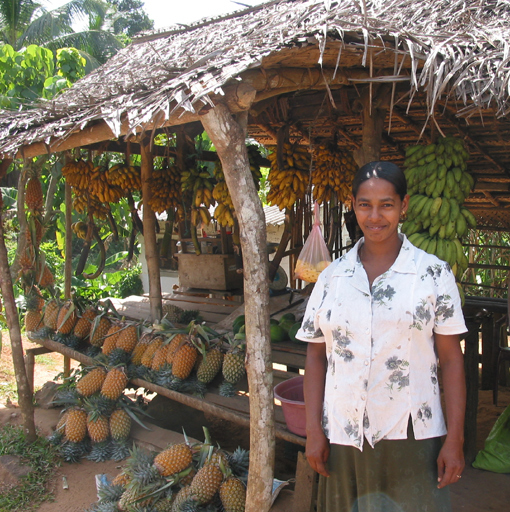 This lady operating a fruit stand in the midst of the pineapple fields of Sri Lanka can strip the hide off a pineapple in a flash and serves it with a salt and red pepper garnish. Surprisingly tasty. 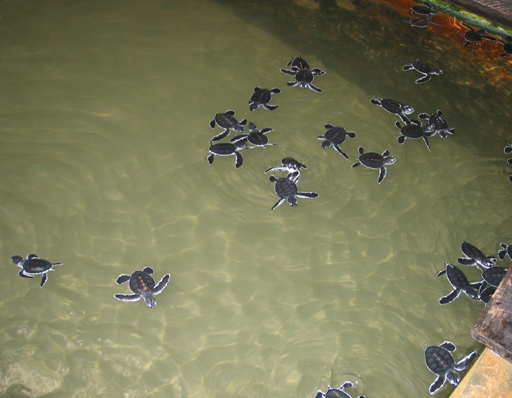 Several southern beaches are egg laying sites for endangered sea turtle species. Conservatories, collect the eggs and allow them to hatch free from predation. 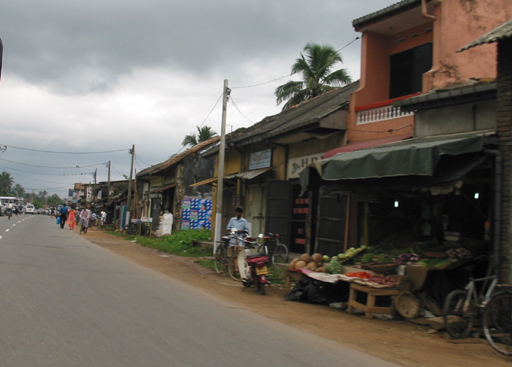 We returned to Callisto on 23 December, two days before the tsunami destroyed Galle and altered our plans for 2005.